Carnival in Rio, with its contagious excitement and colorful sambadrome parties is on every adventurous traveler’s must-see list. Azamara Club Cruises understands that need to see and experience world celebrations and has carefully crafted a 12-night voyage which, not only provides insider access to Carnival in Rio, but also to some of the most striking and intriguing destinations in South America. 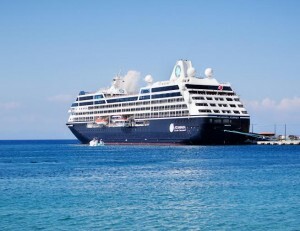 Guests setting sail on Azamara Journey’s roundtrip Rio de Janeiro voyage, departing Feb. 7, 2015, are in for an unforgettable experience, visiting several jewels of South America, including Montevideo, and Punta del Este, Uruguay; Buenos Aires, Argentina; and Rio de Janeiro and Buzio, Brazil. Up-market travelers can still join in this once-in-a-lifetime celebration with Azamara Club Cruises. For more information on Azamara’s 12-night Rio Carnival & Buenos Aires voyage and the cruise line’s Land Discoveries (shore excursion) offerings, please visit http://tinyurl.com/necmg65. The highlight of the voyage is certainly the elaborate celebration which overtakes Rio de Janeiro and Brazil for the four days marking Carnival. With an overnight stay, Azamara Club Cruises’ guests will have ample time to explore famous landmarks like Sugarloaf and the Christ the Redeemer statue overlooking the sprawling city, or perhaps take a stroll along Copacabana Beach, before the evening’s excitement begins. Through Azamara’s Land Discoveries (shore excursions), guests will have exclusive access to the highly sought-after reserved VIP and grandstand seating in the sambadrome to catch the incredible floats and performers, as well as join in the enthusiastic dancing and revelry that continues well into the night or until guests are ready to head back to Azamara Journey, their home away from home. wines, which make the region famous world-wide. avenues and sidewalk cafes. Azamara Journey then makes it way to the beachside town of Buzio for guests to relax and soak up the sun after the excitement of Carnival in true Brazilian fashion. destination as seen by night through Nights and Cool Places. On board the intimate Azamara Journey and Azamara Quest, guests receive exceptional and personal service and fine cuisine, as well as more inclusive amenities, such as gratuities; complimentary bottled water, sodas, specialty coffee, and teas, as well as boutique wines from around the world, international beers and select standard spirits in the ships’ bars, lounges and restaurants when open; complimentary self-service laundry; English Butler service for suite guests; and shuttle transportation to city centers in ports, where available. CEO @LarryPimentel. Travel agent professionals can access more information and make reservations at www.CruisingPower.com.